Use an electric mixer with a dough hook attached and place the flour and salt in the bowl and mix briefly. Then add the melted butter and gradually the water. Once all combined mix for a further 3 minutes. Don’t overwork. Leave to rest in the fridge for 30 minutes. Take the cold butter and beat into a rectangle that will fit within the dough and chill. 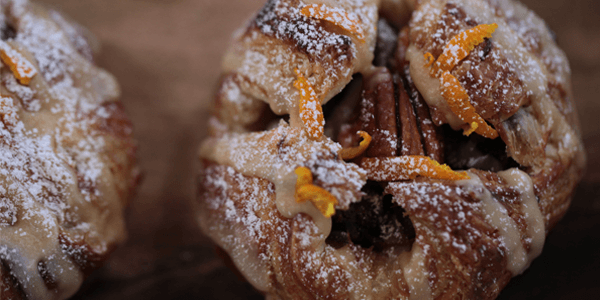 Make the date, pecan and orange filling by placing all ingredients in a food processor and whizzing to combine. Go back to the dough, roll out and place butter in the centre, folding the dough over it. Roll out and fold in half. Complete 3 turns and chill for another 30 minutes. Once dough is cold once again, complete another 2 turns and chill once more for 30 mins. Roll out until ½ cm thick and using a ruler divide into 12 squares.